For other people named William Buckland, see William Buckland (disambiguation). William Buckland DD, FRS (12 March 1784 – 14 August 1856) was an English theologian who became Dean of Westminster. He was also a geologist and palaeontologist. He wrote the first full account of a fossil dinosaur, which he named Megalosaurus. His work proved that Kirkdale Cave had been a prehistoric hyena den, for which he was awarded the Copley Medal. It was praised as an example of how scientific analysis could reconstruct distant events. He pioneered the use of fossilised faeces in reconstructing ecosystems, coining the term coprolites. Buckland followed the Gap Theory in interpreting the biblical account of Genesis as two widely separated episodes of creation. It had emerged as a way to reconcile the scriptural account with discoveries in geology suggesting the earth was very old. Early in his career Buckland believed he had found evidence of the biblical flood, but later saw that the glaciation theory of Louis Agassiz gave a better explanation, and played a significant role in promoting it. Bust of William Buckland, in the Oxford University Museum of Natural History. Buckland was born at Axminster in Devon and, as a child, would accompany his father, the Rector of Templeton and Trusham, on his walks where interest in road improvements led to collecting fossil shells, including ammonites, from the Jurassic-era lias rocks exposed in local quarries. He was educated first at Blundell's School, Tiverton, Devon, and then at Winchester College, from where he won a scholarship to Corpus Christi College, Oxford, matriculating in 1801, and graduating BA in 1805. He also attended lectures of John Kidd on mineralogy and chemistry, developed an interest in geology, and carried out field research on strata during his vacations. He went on to obtain his MA degree in 1808, became a Fellow of Corpus Christi in 1809, and was ordained as a priest. He continued to make frequent geological excursions, on horseback, to various parts of England, Scotland, Ireland and Wales. In 1813, Buckland was appointed reader in mineralogy, in succession to John Kidd, giving lively and popular lectures with increasing emphasis on geology and palaeontology. As an unofficial curator of the Ashmolean Museum, he built up collections, touring Europe and coming into contact with scholars including Georges Cuvier. William Conybeare drew this cartoon of Buckland poking his head into a prehistoric hyaena den in 1822 to celebrate Buckland's ground breaking analysis of the fossils found in Kirkdale Cave. In 1818, Buckland was elected a fellow of the Royal Society. That year he persuaded the Prince Regent to endow an additional Readership, this time in Geology and he became the first holder of the new appointment, delivering his inaugural address on 15 May 1819. This was published in 1820 as Vindiciæ Geologiæ; or the Connexion of Geology with Religion explained, both justifying the new science of geology and reconciling geological evidence with the biblical accounts of creation and Noah's Flood. At a time when others were coming under the opposing influence of James Hutton's theory of uniformitarianism, Buckland developed a new hypothesis that the word "beginning" in Genesis meant an undefined period between the origin of the earth and the creation of its current inhabitants, during which a long series of extinctions and successive creations of new kinds of plants and animals had occurred. Thus, his catastrophism theory incorporated a version of Old Earth creationism or Gap creationism. Buckland believed in a global deluge during the time of Noah but was not a supporter of flood geology as he believed that only a small amount of the strata could have been formed in the single year occupied by the deluge. It must already appear probable, from the facts above described, particularly from the comminuted state and apparently gnawed condition of the bones, that the cave in Kirkdale was, during a long succession of years, inhabited as a den of hyaenas, and that they dragged into its recesses the other animal bodies whose remains are found mixed indiscriminately with their own: this conjecture is rendered almost certain by the discovery I made, of many small balls of the solid calcareous excrement of an animal that had fed on bones... It was at first sight recognised by the keeper of the Menagerie at Exter Change, as resembling, in both form and appearance, the faeces of the spotted or cape hyaena, which he stated to be greedy of bones beyond all other beasts in his care. by these inquiries, a distinct epoch has, as it were, been established in the history of the revolutions of our globe: a point fixed from which our researches may be pursued through the immensity of ages, and the records of animate nature, as it were, carried back to the time of the creation. While Buckland's analysis convinced him that the bones found in Kirkdale Cave had not been washed into the cave by a global flood, he still believed the thin layer of mud that covered the remains of the hyaena den had been deposited in the subsequent 'Universal Deluge'. He developed these ideas into his great scientific work Reliquiæ Diluvianæ, or, Observations on the Organic Remains attesting the Action of a Universal Deluge which was published in 1823 and became a best seller. However, over the next decade as geology continued to progress Buckland changed his mind. In his famous Bridgewater Treatise, published in 1836, he acknowledged that the biblical account of Noah's flood could not be confirmed using geological evidence. By 1840 he was very actively promoting the view that what had been interpreted as evidence of the 'Universal Deluge' two decades earlier, and subsequently of deep submergence by a new generation of geologists such as Charles Lyell, was in fact evidence of a major glaciation. He continued to live in Corpus Christi College and, in 1824, he became president of the Geological Society of London. Here he announced the discovery, at Stonesfield, of fossil bones of a giant reptile which he named Megalosaurus ('great lizard') and wrote the first full account of what would later be called a dinosaur. In 1825, Buckland was elected a Foreign Honorary Member of the American Academy of Arts and Sciences. That year he resigned his college fellowship: he planned to take up the living of Stoke Charity in Hampshire but, before he could take up the appointment, he was made a Canon of Christ Church, a rich reward for academic distinction without serious administrative responsibilities. 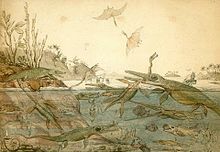 In December 1825 he married Mary Morland of Abingdon, Oxfordshire, an accomplished illustrator and collector of fossils. Their honeymoon was a year touring Europe, with visits to famous geologists and geological sites. She continued to assist him in his work, as well as having nine children, five of whom survived to adulthood. His son Frank Buckland became a well known practical naturalist, author, and Inspector of Salmon Fisheries. On one occasion, Mary helped him decipher footmarks found in a slab of sandstone by covering the kitchen table with paste, while he fetched their pet tortoise and confirmed his intuition, that tortoise footprints matched the fossil marks. His daughter, author Elizabeth Oke Buckland Gordon, wrote a biography of her father that included appendices of positions held by Buckland, his membership in professional societies, and an index of his publications. On 18 January 1823 Buckland walked into Paviland Cave, where he discovered a skeleton which he named the Red Lady of Paviland, as he at first supposed it to be the remains of a local prostitute. It is the oldest anatomically modern human found in the United Kingdom. Although he found the skeleton in Paviland Cave in the same strata as the bones of extinct mammals (including mammoth), Buckland shared the view of Georges Cuvier that no humans had coexisted with any extinct animals, and he attributed the skeleton's presence there to a grave having been dug in historical times, possibly by the same people who had constructed some nearby pre-Roman fortifications, into the older layers. Carbon-data tests have since dated the skeleton, now known to be male as from circa 33,000 years before present (BP). The fossil hunter Mary Anning noticed that stony objects known as "bezoar stones" were often found in the abdominal region of ichthyosaur skeletons found in the Lias formation at Lyme Regis. She also noted that if such stones were broken open they often contained fossilised fish bones and scales, and sometimes bones from small ichthyosaurs. These observations by Anning led Buckland to propose in 1829 that the stones were fossilised faeces. He coined the name coprolite for them; the name came to be the general name for all fossilised faeces. In all these various formations our Coprolites form records of warfare, waged by successive generations of inhabitants of our planet on one another: the imperishable phosphate of lime, derived from their digested skeletons, has become embalmed in the substance and foundations of the everlasting hills; and the general law of Nature which bids all to eat and be eaten in their turn, is shown to have been co-extensive with animal existence on our globe; the Carnivora in each period of the world's history fulfilling their destined office, – to check excess in the progress of life, and maintain the balance of creation. Buckland had been helping and encouraging Roderick Murchison for some years, and in 1831 was able to suggest a good starting point in South Wales for Murchison's researches into the rocks beneath the secondary strata associated with the age of reptiles. Murchison would later name these older strata, characterised by marine invertebrate fossils, as Silurian, after a tribe that had lived in that area centuries earlier. In 1832 Buckland presided over the second meeting of the British Association, which was then held at Oxford. The myriads of petrified Remains which are disclosed by the researches of Geology all tend to prove that our Planet has been occupied in times preceding the Creation of the Human Race, by extinct species of Animals and Vegetables, made up, like living Organic Bodies, of 'Clusters of Contrivances,' which demonstrate the exercise of stupendous Intelligence and Power. They further show that these extinct forms of Organic Life were so closely allied, by Unity in the principles of their construction, to Classes, Orders, and Families, which make up the existing Animal and Vegetable Kingdoms, that they not only afford an argument of surpassing force, against the doctrines of the Atheist and Polytheist; but supply a chain of connected evidence, amounting to demonstration, of the continuous Being, and of many of the highest Attributes of the One Living and True God. Following Charles Darwin's return from the Beagle voyage, Buckland discussed with him the Galapagos land iguanas and Marine iguanas. He subsequently recommended Darwin's paper on the role of earthworms in soil formation for publication, praising it as "a new & important theory to explain Phenomena of universal occurrence on the surface of the Earth—in fact a new Geological Power", while rightly rejecting Darwin's suggestion that chalkland could have been formed in a similar way. By this time Buckland was a prominent and influential scientific celebrity and a friend of the Tory prime minister, Sir Robert Peel. In co-operation with Adam Sedgwick and Charles Lyell, he prepared the report leading to the establishment of the Geological Survey of Great Britain. Having become interested in the theory of Louis Agassiz, that polished and striated rocks as well as transported material, had been caused by ancient glaciers, he travelled to Switzerland, in 1838, to meet Agassiz and see for himself. He was convinced and was reminded of what he had seen in Scotland, Wales and northern England but had previously attributed to the Flood. When Agassiz came to Britain for the Glasgow meeting of the British Association, in 1840, they went on an extended tour of Scotland and found evidence there of former glaciation. In that year Buckland had become president of the Geological Society again and, despite their hostile reaction to his presentation of the theory, he was now satisfied that glaciation had been the origin of much of the surface deposits covering Britain. In 1845 he was appointed by Sir Robert Peel to the vacant Deanery of Westminster (he succeeded Samuel Wilberforce). Soon after, he was inducted to the living of Islip, near Oxford, a preferment attached to the deanery. As Dean and head of Chapter, Buckland was involved in repair and maintenance of Westminster Abbey and in preaching suitable sermons to the rural population of Islip, while continuing to lecture on geology at Oxford. In 1847, he was appointed a trustee in the British Museum and, in 1848, he was awarded the Wollaston Medal, by the Geological Society of London. The standard author abbreviation Buckland is used to indicate this person as the author when citing a botanical name. Buckland preferred to do his field palaeontology and geological work wearing an academic gown. His lectures were notable for their dramatic delivery and he was known to occasionally lecture on horseback. When he lectured indoors he would bring his presentations to life by imitating the movements of the dinosaurs under discussion. Buckland's passion for scientific observation and experiment extended to his home, where he had a table inlaid with dinosaur coprolites. The original table top is exhibited at the Lyme Regis Museum. Not only was William Buckland's home filled with specimens – animal as well as mineral, live as well as dead – but he claimed to have eaten his way through the animal kingdom: zoöphagy. The most distasteful items were mole and bluebottle fly; panther, crocodile and mouse were among the other dishes noted by guests. The raconteur Augustus Hare claimed that "Talk of strange relics led to mention of the heart of a French King preserved at Nuneham in a silver casket. Dr. Buckland, whilst looking at it, exclaimed, 'I have eaten many strange things, but have never eaten the heart of a king before', and, before anyone could hinder him, he had gobbled it up, and the precious relic was lost for ever." The heart in question is said to have been that of Louis XIV. Buckland was followed in this hobby by his son Frank. Dorsum Buckland, a wrinkle ridge on the Moon, is named after him. Buckland Island (known today as Ani-Jima), in the Bonin Islands (Ogasawara-Jima), was named after him by Captain Beechey on 9 June 1827. In 1846, William Buckland was rector of St. Nicholas in Islip and is commemorated on a plaque in the south aisle of the church and the "East Window" was dedicated to the memory of Buckland and his wife in 1861. A plaque is dedicated to him near his summer home by the Old Rectory, The Walk, Islip (10 August 2008). ^ Foster, Joseph (1888–1892). "Buckland, William" . Alumni Oxonienses: the Members of the University of Oxford, 1715–1886. Oxford: Parker and Co – via Wikisource. ^ "Book of Members, 1780–2010: Chapter B" (PDF). American Academy of Arts and Sciences. Retrieved 9 September 2016. ^ "Out of Africa: modern human origins special feature: isotopic evidence for the diets of European Neanderthals and early modern humans". Proc. Natl. Acad. Sci. U.S.A. 106 (38): 16034–9. September 2009. Bibcode:2009PNAS..10616034R. doi:10.1073/pnas.0903821106. PMC 2752538. PMID 19706482. ^ Rudwick, Martin Worlds Before Adam: The Reconstruction of Geohistory in the Age of Reform pp. 154–155. ^ Rudwick, Martin Worlds Before Adam: The Reconstruction of Geohistory in the Age of Reform p. 155. ^ Retrieved 2 August 2018. ^ "Darwin Correspondence Project – Letter 359 – Darwin, C. R. to Buckland, William, (15 June 1837)". Retrieved 23 December 2008. ^ "Darwin Correspondence Project – Letter 404 – Buckland, William to Geological Society of London, 9 Mar 1838". Retrieved 23 December 2008. ^ Daily Telegraph Issue no 50,404 dated 10 June 2017 p33 > "The Abbey dean who ate the heart of a king"
^ Burke, Peter (2013-04-18). A Social History of Knowledge II: From the Encyclopaedia to Wikipedia: 2 (Kindle Location 2276). Wiley. Kindle Edition. ^ Birk, Aaron; Robert Krulwich. "Who Wants To Eat Jellyfish Omelets? Dolphin Meatballs? Mouse-On-Toast? These Guys". Krulwich wonders ... npr. Retrieved 27 September 2012. ^ Fraser Lewry (25 February 2008). "The man who ate everything". WordOfMouth blog. theguardian. Retrieved 27 September 2012. ^ Buckland, William (1869). Geology and mineralogy as exhibiting the power, wisdom, and goodness of God. with additions by Professor Owen, Professor Phillips [and] Robert Brown, vol. 1, 4th edition. London: Bell & Daldy. p. lxii. "Review of The Life and Correspondence of William Buckland, D.D., F.R.S. by his daughter, Mrs. Gordon; The Life of Richard Owen by his grandson, the Rev. Richard Owen". The Quarterly Review. 180: 381–405. April 1895. This article incorporates text from a publication now in the public domain: Chisholm, Hugh, ed. (1911). "Buckland, William" . Encyclopædia Britannica (11th ed.). Cambridge University Press. McGowan, Christopher (2001). The Dragon Seekers. Persus Publishing. ISBN 0-7382-0282-7. Rupke, Nicolaas (1983). The Great Chain of History: William Buckland and the English School of Geology 1814–1850. Oxford University Press. Wikimedia Commons has media related to William Buckland. William Buckland (1823) Reliquiæ Diluvianæ (English) – digital facsimile available from Linda Hall Library. A number of high-resolution images of the maps and other illustrations from this book are available here.